Remind a friend how much she means to you and remind yourself about the treasure of friendship with this charming gathering of quotes and inspiration. The contemporary, cafe-cozy look invites you to savor moments of gratitude, encouragement, and pure cheer. A Friend Loves at All Times is one of the most endearing go-to gifts you can give or receive. It is as motivating as your first cup of coffee and as joyful as a splash of new color in your wardrobe. This celebration of all that makes a friend special--kindness, humor, sincerity, love--will add delight to anyone's day and, most likely, will add adornment to a prominent place in her home for a long time to come. 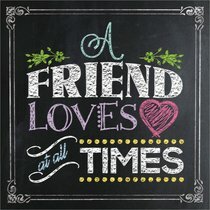 About "A Friend Loves At All Times"